nopCommerce allows you to limit available shipping methods per country. Also we support “no shipping required” products (e.g. services). Addresses. nopCommerce also allows your customers to give two different addresses for billing and shipping, so they can easily send items as gifts. Shipping methods. 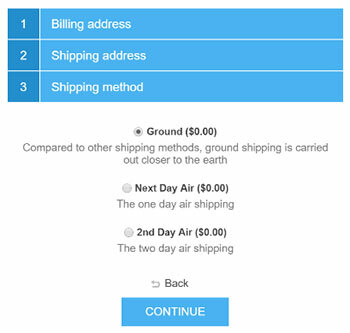 A store owner can define custom shipping methods (e.g. Ground, Next Day, 2nd Day, etc) or use popular shipping carriers (e.g. UPS, USPS, FedEx, etc). nopCommerces is integrated with major shipping carriers. Your customers can choose their preferred carrier based on experience, price, or destination.